Collision repairers call themselves “I-CAR certified,” “Ford certified,” etc. — but are they using the terms correctly, and if so, do customers even understand or care about what’s been measured? And none of these certify the work being done on the vehicle, just as a driver’s license doesn’t mean you’ll drive safely and CPA status doesn’t mean an accountant won’t screw up your taxes. This is not to say that any of these benchmarks aren’t worthwhile. All do denote a shop or technician who has demonstrably invested more time and effort into improving themselves than a party who hasn’t. But it’s important for consumers — and shops — to realize precisely what capabilities that frame or logo on the wall indicates and what it doesn’t. 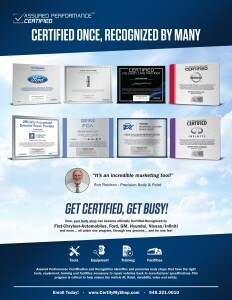 Assured Performance’s certification applies to a network of mainstream automakers. You’re certified for one, you can apply it towards any of them. Standards for the group can increase each year. For example, Assured Vice President of certification Aaron Clark said that Nissan wanted proof of a couple of items not checked by Assured, and Assured decided to make those part of the standards for the group. “What’s certified today isn’t necessarily going to be certified tomorrow,” Clark said. “Every year, we raise the bar,” Biggs said, to be sure shops are up to fixing the new model year of their OEMs. Repairers have 6-12 months to comply with the new standards and keep certification. “We go way overboard to make sure,” Biggs said. It’s not “‘Pay me and you’re certified,'” he said. The point is to be stringent but standardized, eliminating the headache of having repairers jump through different hoops for different OEMs to obtain certification on common vehicles. As Biggs explained it, Assured certifies, while the OEMs recognize (or whatever verb manufacturer marketing departments cooked up). It’s kind of like passing the Advanced Placement calculus test in high school and having colleges agree that you’re good enough at the subject that they’ll give you credit too. Assured’s standardization doesn’t mean a certified shop can ignore OEM-specific guidelines for a particular repair, and Clark said the shop must have a subscription to the guidelines for a particular OEM. (Some shops “sad but true” still don’t have those, he said.) Certification just indicates that all of Assured’s OEMs feel the business is qualified enough they can send customers through the door without worrying the staff will botch the repair and tarnish their brand. As Mike Anderson of Collision Advice has observed, citing a Chrysler staffer: 60 percent of repairer clients who have to take their car back again to correct something are likely to ditch it and buy one from another manufacturer within a short time. Most of Assured’s partner OEMs (including Hyundai) allow for infinite certified shops within a market, though Nissan limits who has it within a region. Honda, which opted for its own ProFirst program, also provides market protection for about six miles, according to Ron Reichen, owner of Honda/Acura ProFirst-certified Precision Auto Body and Paint. “There’s a little bit of protection there,” Reichen said. The dual Ford degrees could be a taste of the future, according to Clark and Biggs. “Any other car manufacturer could do the same thing,” Clark said, though such additional certification programs would still require a shop to meet the baseline rules. Biggs said the amount of innovation in vehicles could ultimately mean future collision repairer certification only applies to a particular model year. 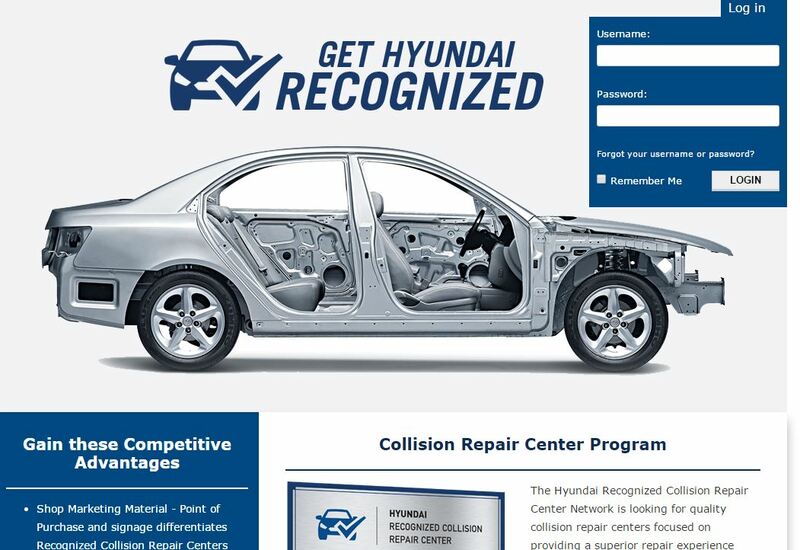 Only 5 percent of repairers have been certified by Assured, and they’re trying to get that number to 10 percent. “That’s huge heavy lifting,” Biggs said. Besides the list of requirements (including some optional “advanced capabilities”), Assured visits the shop and checks to make sure it’s the kind of place a Fortune 500 automaker would want to send their customers. Reichen said the company even checks the bathrooms. Inspections occur at an agreed-upon time, but there could be more than a single one in a given year. “There could be as many as possible, as many as necessary,” Clark said. While Assured’s system allows a repair done incorrectly in one state to be rerepaired by another Assured shop in case of a problem, according to Biggs, Assured only truly certifies a shop, not an employee or the actual repair, Clark said. Luxury brands typically require repairers to take their actual classes, said Gary Wano Jr. of G.W. and Sons., a shop certified in companies including Jaguar, BMW, Tesla and Mercedes. “It’s a pretty grueling course,” Wano said of Jaguar’s. BMW and Mercedes even have a couple of aesthetics courses, and the companies do test to ensure one can properly install their components. For Mercedes, one technician must take 15-20 master technician segments, which can take one to four days. Some manufacturers also have more stringent demands on a certified shop after the initial process. Tesla only checks three to four areas every two years; Jag does one ever two years. But BMW and Mercedes, “those are the guys where you train constantly,” Wano said. Some luxury manufacturers are more particular about where a vehicle can even be repaired; for example, forget about working on a Mercedes without a training number, Wano said. That’s the situation for Jaguar and Tesla as well. “There’s another piece of it,” he said. “We’re training as much as any of the (BMW)-certified repairers are training,” Wano said. A dealership must also sponsor the repairer, too. For Reichen, who runs a larger operation, certification through Assured and then Honda’s ProFirst — not to mention luxury brands like Tesla and Audi — wasn’t a problem. “We have economies to scale,” he said. “The rivet guns, it’s a different story,” Reichen said. Precision has nine, each costing $10,000, a potential barrier to entry for some of the luxury OEMs. “Everybody has their own pet rivet gun,” he said. Reichen supported the idea of certification and sooner, rather than later — “it’s never going to get cheaper” — but he said it’s important to know your market. One of his stores (near Nike) is more likely to see Asian and luxury cars than an F-150, for example. He gave the example of a collision repairer who wants to get Jaguar-certified because it sounds cool. The “simplest and cheapest” way to check one’s market, he said, was to file a public records request with the Department of Motor Vehicles and ask for all the cars registered in the area, even potentially digging as deep as model years (for example, 3-year-old or newer Audis) or ZIP codes. “It’s a long-term ROI,” he said.